Wow! When you figure out what is going on in Chicago, make sure you let us know. I moved from the Chicago area to Connecticut and I’m attempting to salvage 6 acres of my own and return them to their pre-mustard garlic state. It is rough going. So glad to hear that CBG has conquered it! Can you post directions for making the scythe? Also, the thought here is that if you weed-whack them just as they start to bloom, they won’t set seed and will just die. Did you ever try that? Will you be studying the anomaly/virus? My experience is that if you cut the plants while they are flowering, they will re-flower and still produce seed. 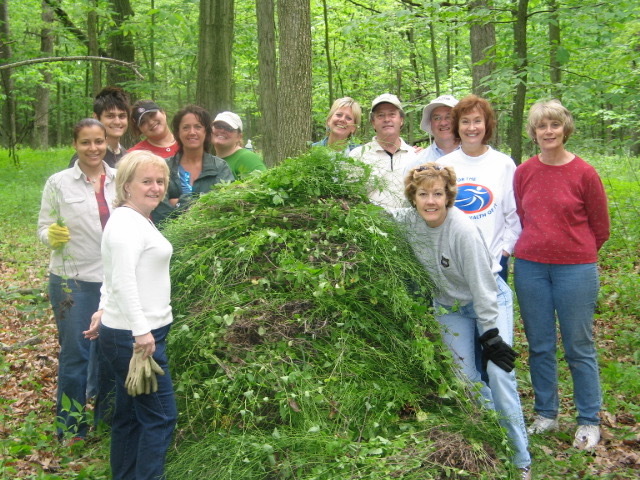 Mostly, we pull flowering plants and remove them from the woods. I have seen flowering plants that were pulled and left in the woods during rainy weather and they continued to grow and develop seed pods. If I decide to cut plants, I wait until the green seed pods develop and the plants are completely done flowering, then I cut them and remove them from the site. The green seed pods will continue to develop it left in the woodland. I agree. 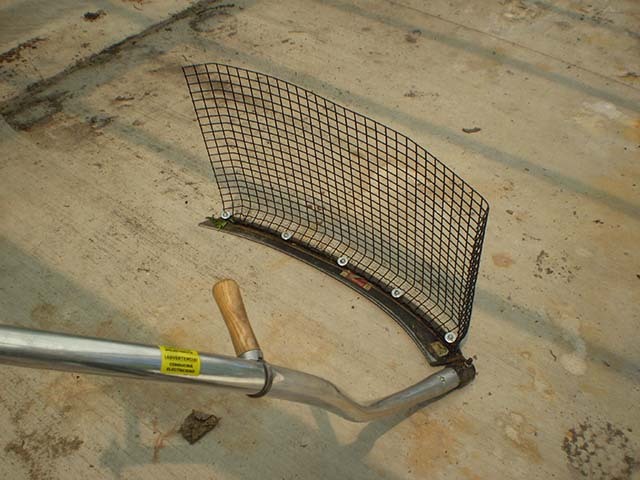 Name the man who invented that cool tool. The weird behavior of garlic mustard may have something to do with the presence of the invasive jumping worms (Amynthas spp.) from Asia, which are spreading on the North Shore. These worms change the soil structure and soil chemistry, sequestering nitrate and making the soil more alkaline, changing the composition of the bacterial population, depleting mycrorryzae etc., and their effects on individual plants are mostly unknown (woodland ephemerals will decline as the worms eat the duff layer). Perhaps something in the worm castings repels garlic mustard? Perhaps the earthworms eat their seeds? You are right to be concerned about jumping worms. They can have devastating impacts on the soil and leaf litter. However, as it relates to garlic mustard, we do not have jumping worms, yet, in our woodland. So I do not think they are a factor for us. I would also mention that all of the earthworms we have in Northeastern Illinois are exotic species that tremendously disrupt the functioning of our natural ecosystem. We have studied them for a number of years, even when garlic mustard was growing abundantly, seemingly without affect on the mustard. The jumping worms have arrived at the Botanic Garden, but so far they have not spread to our woodland. I am so happy for you. I have just a small piece of property on a ravine and struggle with garlic mustard every year. To Jane: In your comment about weed whacking, it is my understanding that even if you cut all the flowers off, they will still go to seed. So unless you rake up all the cuttings from the weed-whacking you will still have a problem. It does say that it is “best” to pick them all up and bag them after cutting. I’m wondering if CBG has ever tried this. I’m curious about whether they really do set seed if you cut them down early enough. have only one or two flowers, but still will produce a set of seeds! of seed from the pile. Years ago Jim S. told me it would take 6 to 7 years of pulling to eliminate it. I think it took over 10 years. I have not seen one plant this spring. The bad news is that fields of lesser celedane and dames rocket replaced the mustard. The key is to introduce or encourage replacement species. At the Schlitz Audubon nature center, we saw woodland goldenrod take over , more each year as we attended to certain areas on our path down the bluff. Jewel weed will also dominate garlic mustard. If given the chance.. disturbed soil will yield weeds forever if replacement is not offered. Wendy Walcott, land manager, SANC, retired. You introduce an important point. 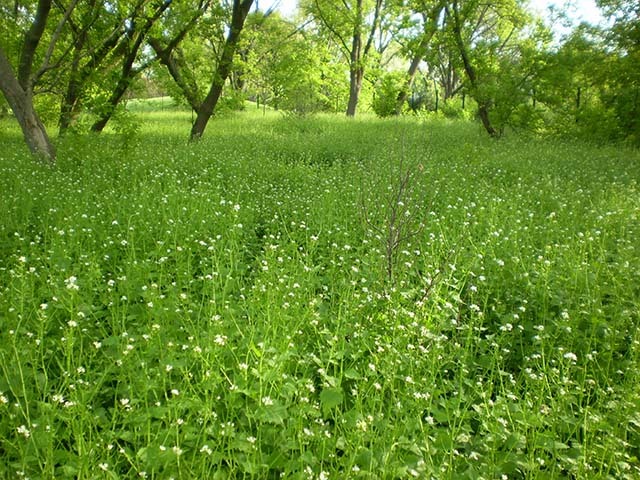 Removing garlic mustard without also providing competition, if none exists is very important. One of the reasons we decided to cut the unripe seed heads in the Reserve is that we had seeded the entire area with native species. It was only after controlling invasives for two years and seeding native species that the garlic mustard seemed to emerge from nowhere. By cutting the unripe seed heads, we did not tear the newly established natives out of the ground or disturb the soil. Does this creative, inventive mechanic have a name?? I suspect if the device had been invented by someone on senior staff, that person’s name would have been stated. This feels very disrespectful to those who do much of the hardest work at the Garden. You can do better. The “garlic-mustard-harvesting scythe” was an idea of mine that I thought would be useful for tackling the garlic mustard in our woodlands, particularly the Barbara Brown Nature Reserve. Riley Obenchain, one of the Garden’s talented mechanics, helped me bring this idea to life. I have collaborated with Riley on a number of projects over the years. I’ll come-up with an idea for a tool that could help us better manage our natural areas, and then bring Riley that concept along with some bits and pieces of material. Using Riley’s sharp mechanical mind along with additional materials that he might dig up from his shop, together we create a new and useful tool. Nice to learn. That should have been in the story at the outset. Jim, What an amazing story of 20 years of tenacity, perseverance and ingenuity. Nightmare indeed! I live next to undeveloped park district property and will have to quit whining now about the comparatively few unwanted specimens I find in my yard and garden each year. (As an aside, your mustard seed quote was familiar but recognized from a different earlier source – Matthew 17:20). What a inspirational saga! Well done. Next Next post: Corpse Flower Science: Will one Titan Twin bloom longer?